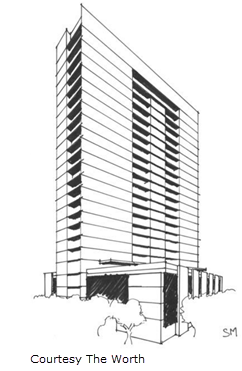 ​​ ​FORT WORTH – Plans have been unveiled for a 24-story condominium tower that will bring 115 luxury homes to downtown. The tower, called The Worth, will sit along North Henderson St. bound by West Bluff St., Mills St., and West Peach St. The homes will offer premium appliances, gas cooktops, high-end cabinetry and designer finishes.